This is it, the final dish in this week’s Chinese New Year series and what a tasty week it’s been! So many great Chinese food recipes out there but I chose three of the ones I always order when I’m in the mood for take out. 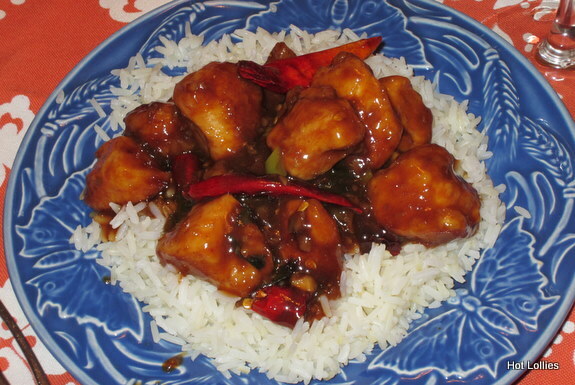 My third dish is spicy General Tso chicken. Yes, I can hear you, “that’s so American” but I just couldn’t help myself. I just love the sweet, spicy and crispy flavors in this dish. When I’m in the mood for real Chinese I’ll just head over to Joe Shanghai’s in New York City’s Chinatown or Szechuan Gourmet on 39th, and when I’m really feeling adventurous I’ll trek over to Main St, Queens! I selected a recipe I had bookmarked from the From Away blog simply because the photos were stunning and mouth watering. Making recipes from books, magazines, and online sites can be a hit or a miss at times since dishes never come out exactly as shown or expected. This one however was a definite hit! I did make a couple of changes like adding more chile peppers because I just like it extra spicy and found a great substitute for sherry because I didn’t have any but other than that I pretty much followed their instructions step by step. I didn’t have sherry on hand and figured I can use dry white wine as as substitute. I usually keep wine stocked but nooo, I didn’t have that either! No worries though, not all was lost since apparently a mixture of vinegar, sugar and lemon works just as well, thanks to Google! Let me tell you, the dish tasted just like the restaurant version, but only better! Maybe the sherry would have made a slight difference and next time I make this I’ll try it but I was very happy with the results. 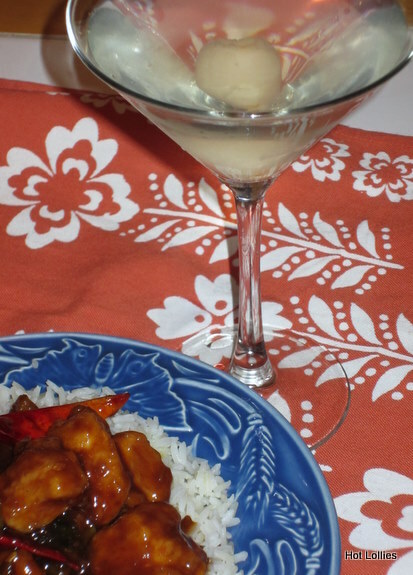 Here I paired the spicy general tso chicken with a lychee martini to complement the dish, see martini recipe below. This is really a great meal, and not the sugary, fatty mess you sometimes get from fast foods restaurants. Once you make this, I’m sure you won’t want to order it again. 1. Add the first 7 ingredients to a bowl, then add the cornstarch and mix well, set aside. 2. In a separate bowl, add diced chicken, sherry substitute (mix white vinegar, 1 tsp sugar, lemon) and let marinate for 15 minutes. After marinating, pat dry the chicken with paper towels and add the 1/3 cup of cornstarch until chicken is well coated. 3. 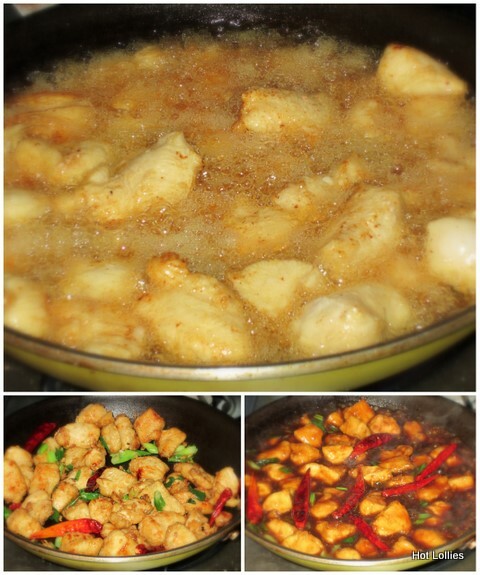 Fry chicken in a pan with vegetable oil until crispy, about 8 minutes, make sure both sides are cooked. Remove chicken from oil and place on paper towels to absorb oil. Discard oil used but leave about a tbsp. 4. Add garlic, ginger to pan and saute for a few seconds then add scallions and peppers and saute for less than a minute. For a spicier dish, break apart at least 2 of the chile peppers. Add the fried chicken to pan and stir well. Finally, add the liquid mixture and continue to stir until sauce thickens. 5. Serve over white or brown rice! Add vodka and lychee juice to a martini shaker filled with ice. Shake it, shake it! Drop a lychee to a chilled martini glass and pour. Enjoy!